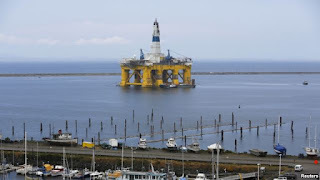 The president of Shell Oil Co. said exploratory drilling off Alaska's northwest coast is going well despite stormy weather last week that caused the company to halt operations for a few days. 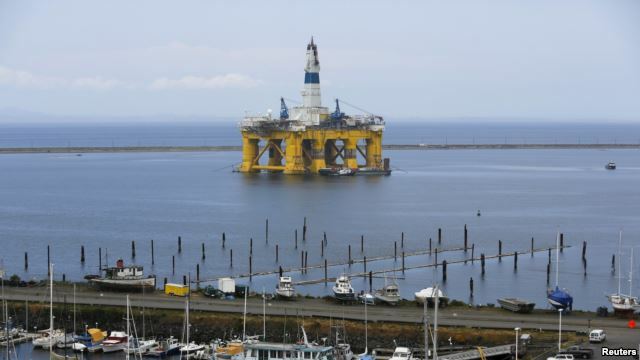 And in an interview Tuesday with The Associated Press, Marvin Odum said he expects further protests against the company's plans for Arctic drilling like the ones in Seattle and Portland where activists in kayaks tried to block Shell vessels. Arctic offshore drilling is bitterly opposed by environmental groups, which say a spill cannot be cleaned in ice-choked waters and that industrial activity will harm polar bears, walrus and ice seals already harmed by diminished sea ice. In Seattle, Shell faced protests on the water by “kayaktivists” upset over the company staging equipment in the city. In Portland, Oregon, Greenpeace USA protesters hung from the St. Johns Bridge to delay a Shell support vessel, from heading to the Arctic. Odum said he's “110 percent ready” to work with people who want to find ways to improve drilling. “I do have an issue with those that oppose who use illegal means or put the safety of themselves or the safety of anybody associated with this operation at risk,” he said. Odum is staying in the same hotel as the president - the Hotel Captain Cook. “It's probably fair to say, this is the most scrutinized, analyzed project - oil and gas project - probably anywhere in the world. I'm actually sure of that,” he said. “We can't afford to have a problem here,” Odum said.